and around homes. Easily mixed with water. Provides residual. it will work well for mosquitoes and can mixed with pyrethrin. is odorless and is even labeled for use on pets. 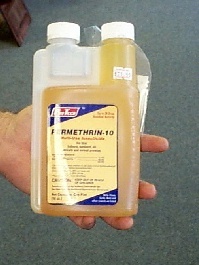 a gallon of water when mixing it with an ounce of pyrethrum. mosquitoes, use the super concentrate which is 3 times as strong. water when mixed with one ounce of pyrethrum. PACKAGING AND COST:    Several sizes are available. or New Jersey. Cannot ship either to New York.